I love making a quick and easy bread recipe for breakfast or dessert. This one is super simple, rises beautifully, and comes out the perfect amount of moistness. I make my bread with fresh blueberries but you can use frozen if that’s what you have on hand – just don’t defrost them beforehand! You will need a 9×5 loaf pan. Even though they’re non-stick, it’s a good idea to do it the old-fashioned way and grease the pan well and flour it. That way, it ensures that your loaf won’t stick in the pan and it will slide out easily after you flip it over. I use fresh blueberries for this recipe, but you can use frozen if you wish. When mashing my bananas, I just used a fork. No fancy mashers or beating with a mixer. I made this bread by using a spoon instead of a hand mixer. It prevents the bread mix from becoming overbeaten which can alter your results and make the bread denser than desired. When making bread, it’s important to use fresh baking powder and baking soda. Using baking soda and baking powder that has been open for a while can make your bread not rise or cause it to sink in the middle after removing it from the oven. I tried this bread in the Old Mill District when visiting Pigeon Forge, Tennessee. The stores there were so inspiring and everything was so delicious! It smelt amazing walking through the Farmhouse Kitchen store and getting to try all of the amazing samples they had on display. Their Blueberry Banana Bread was one that I absolutely fell in love with. Everything in their store is made with natural ingredients and you could even watch the ladies in the kitchen preparing the food that they sell in the store! There was a wide variety of bread, dips, sauces, oils, and vinegar. 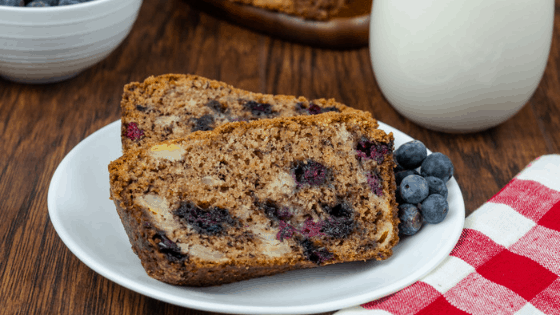 This deliciously moist blueberry banana loaf bread can easily be cut into 10 slices. You could even make this loaf feed a crowd by slicing it into 20 squares! It’s so easy enough to double this recipe if you want to make a second loaf! In a bowl, blend together the flour, cinnamon, nutmeg, baking soda, and baking powder. In a large bowl, blend eggs, sugar, oil and vanilla extract. Add in the mashed bananas and blueberries. Slowly add the dry ingredients into the wet ingredients until blended well. Pour mixture into greased and floured loaf pan and bake in the oven for about 55 minutes. Check with a toothpick in center of the loaf to make sure it comes out clean. Remove from the oven and let cool for about an hour before slicing and serving.